The Rotaract Club of Lilongwe has inducted nine new members last Saturday night, June 20th, 2015 bringing the Club membership to a total of 35. The induction took place at a black-tie dinner function known as the End of Year Soirée, an annual event held every June to mark the closing of the rotary year. Kondwani Kapewa, Alfred Kalumbi, Ruth Chatata, Allan Nasoro, Timothy Ntilosanje, Atanazio Chigona, Cornelius Mussa, Thandi Ngalande and Fraser Nyale were inducted into the club earning themselves the privilege of being addressed as Rotaractors. The new members were also accorded the Rotaract Club badge to symbolize their membership into the club. The badge was pinned on each of the new Rotaractors by their respective hosts, who are already members of the club, who invited and sponsored them into the club membership. The Induction ceremony was presided over by the Club’s President, Chifundo Patience Chilera. 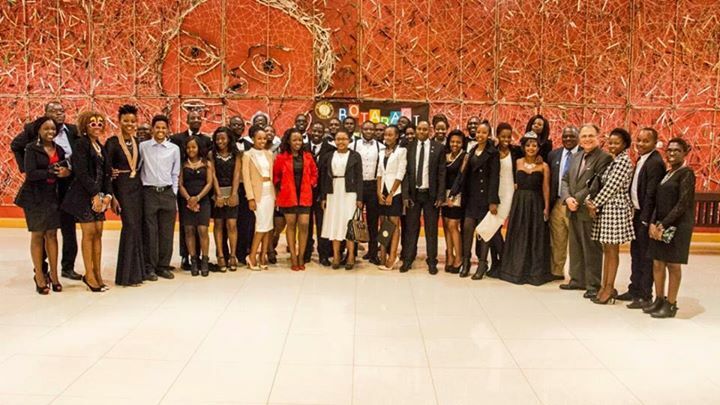 At the same event, Rotaractor Jethro Longwe was inaugurated into the Rotaract Club of Lilongwe Hall of Fame; a list of all Rotaractors who have been a part of the membership of the Club and are due for progression into the Rotary Club. Various other awards were also given to recognize the distinguished contributions and dedication of the club members in making the club service and fellowship fun and fulfilling during the year just ended. The End of Year Soirée was graced by the District Governor Elect for Rotary District 9210, Dean Lungu; President of Rotary Club of Lilongwe Sophie Kalinde; President Elect of Rotary Club of Lilongwe Chris Kapenda; and Past President Joseph Chavula of Rotary Club of Bwaila. Rotarian Qabaniso Malewezi, who is the deputy director of youth services at Rotary Club of Lilongwe, was the Director of Ceremonies at the event. Rotaract is a youth arm of Rotary International for young men and women ages 18 to 30 who are dedicated to community and international service as well as professional development. The Club in Lilongwe was chartered on February 14th, 2015 and has since carried out various community service activities including mentorship, distribution of relief to flood victims through Red Cross, distribution of teaching and learning materials to peri-urban schools in Lilongwe as well as hosted the first of many talks with distinguished persons who are accomplished in their various profession who can inspire the aspirations of young professionals in Lilongwe.